Nicole Seagriff knew in high school that she wanted to be a nurse like the one who cared for and comforted her mother during treatment for breast cancer. When she got her nursing degree from Boston College, she went to work as a nurse in the intensive care unit at Yale-New Haven Hospital, caring for critically ill patients. “My patients were suffering from complications of high blood pressure, such as a heart attack or stroke. They were losing limbs from uncontrolled diabetes. Treatments were intensive and helpful but not likely to provide a cure. It all seemed so wrong to me. 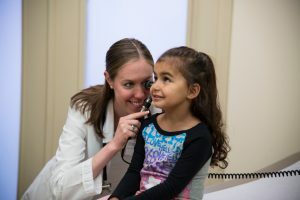 I decided I wanted to help patients before they reached the intensive care unit.” So Seagriff enrolled in Yale’s School of Nursing to obtain a master’s degree and become a family nurse practitioner, working with people on a continuing basis, promoting wellness as well as caring for their ills. “I wanted to get into community health to help people like my aunt who had breast cancer but didn’t seek timely treatment because she didn’t have insurance,” said Seagriff. She enrolled in CHC’s Nurse Practitioner residency program and in 2012 began practicing fulltime at CHC in Norwalk. “I’m very grateful for the residency program,” says Seagriff, who added it gave her the support she needed to really enjoy her work and practice to the full extent of her training and education. She enrolled in Duke University’s online nursing doctorate program to gain skills to improve her practice and patient outcomes. She focused on improving screening for the risk of genetic breast cancer risk, which has special meaning for Seagriff since it had affected not only her aunt, but also her mother and her maternal grandmother. “I realized that if any of my patients came to me with the same family history of breast cancer that I had, I’d encourage them to get genetic testing and that inspired me to get the testing. She discovered she had the BRCA mutation, which increases breast cancer risk, and promptly started to get screenings. Nine months later – at age 26 – she learned she had the disease. With her risk for breast cancer, Seagriff would have started screenings at age 30. “I got a four-year jump on the disease,” said Seagriff. As part of her research, Seagriff found a genetic counseling center less than two miles from the Norwalk and Stamford sites. She also learned that her patients would take advantage of genetic counseling when they were made aware of their risk and when it was close to home, on a bus route, and easy to access.